Aeon Marine and Beavertail Skiffs with Stu Apte will be in Key West Saturday November 24th debuting the new 17' Beavertail Strike skiff. We will be at Hurricane Hole Marina in the morning from 9am - 1:30pm then again at the Salt Water Angler from 3:00pm - onwards. 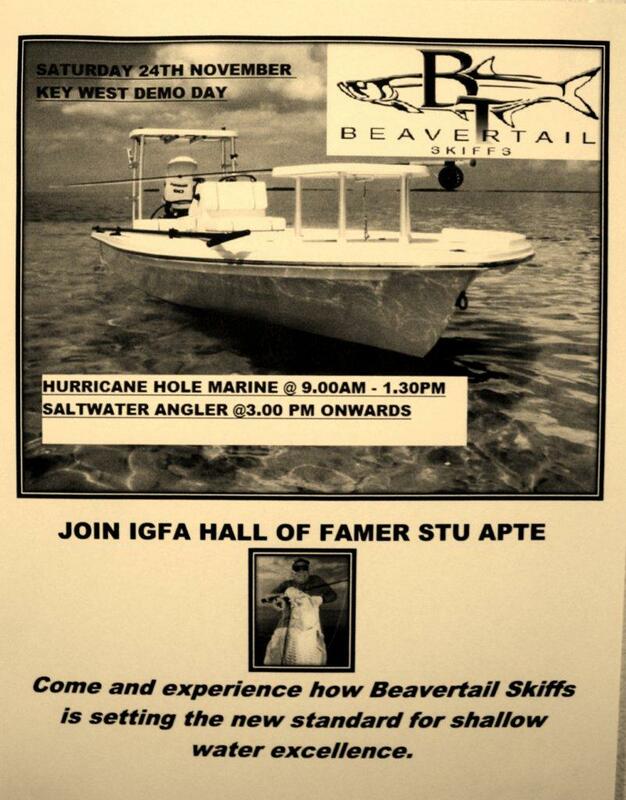 Come by and meet legendary angler and IGFA Hall of Famer Stu Apte. Check out Stu Apte's Signature Series Beavertail, the new Beavertail Strike Skiff, Beavertail BT3 and the Aeon 23 bay boat. Boats will be available onshore and in the water for sea trials. Stu Apte, Aeon Marine owners Will and Liz, Captain Gregg McKee and Captain Mike Bartlett will be on hand to answer your questions and take you out for ride. Then Sunday November 25th the team will be in Islamorada at the Lorelei from 12 noon - onwards. Special thanks to Captain Marlin Scott of FishMonster Magazine, Captain Tony Murphy of Salt Water Angler, Mike Bender of Hurricane Hole Marina and of course Stu Apte for their contributions to this event.